Kickstarter for Dicetopia up and running! Finally we’re live! Check out the campaign right here! Currently 150% funded! Finally the website is up and running! We will keep on adding content as more of our games are revealed. Right now all our focus is on Dicetopia and the Kickstarter campaign for it that will hopefully launch later this fall! 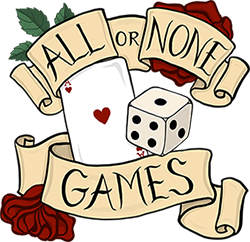 © 2018 All Or None Games. All Rights Reserved.